Industrial Fabrics | Tent & Tensile Fabric | Lightweight Manufacturing Inc.
PVC coated polyester fabric: a high tenacity polyester scrim is coated on both sides with a PVC compound that provides weather resistance, smooth surface, color, and protects the polyester yarns against UV degradation. The higher quality architectural fabrics have a topcoat to protect the PVC coating and improve the cleanliness of the surface. An alternative style is PVC mesh. Polyethylene fabric: high-density PE tapes are woven and coated with low-density PE to provide a weathertight surface. 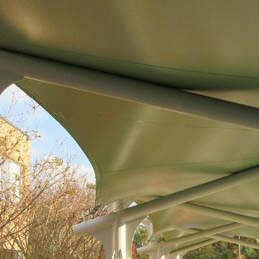 The composition is modified to provide the fire rating and UV protection that is desired. Solution-dyed woven fabric: woven solution-dyed yarns provide a range of breathable, soft-handed fabrics with options for fire-rated and weathertight coatings, preserving the “canvas” look and feel. ePTFE – Tenara fabric: made from woven Tenara yarns. High resistance against repeated folding and high translucency. To get more information or free samples of our product, please fill in the form below, email us, or reach out to one of our experts at (610)435-4720.